This book has been found by 120 other users. Do you have this book? Trade it in for cash! Designed for courses taught at the introductory level in Canadian universities and colleges, this new anthology provides a rich selection of literary texts. In each genre the anthology includes a vibrant mix of classic and contemporary works. Each work is accompanied by an author biography and by explanatory notes, and each genre is prefaced by a substantial introduction. 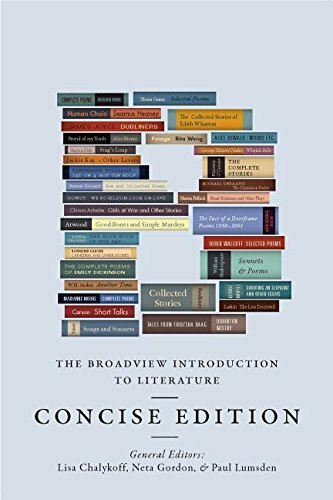 Pedagogically current and uncommon in its breadth of representation, The Broadview Introduction to Literature invites students into the world of literary study in a truly distinctive way. This concise edition offers the literary breadth and pedagogical features of the complete edition in a more compact, affordable package. This anthology comes with access to a companion website for students. An access code is included with all new copies. An instructor’s website is also available; an access code is provided with all desk copies. Details compiled in 3.7920 seconds.